Two pretty good episodes today. One a reflection of us and another that sets up the show further. 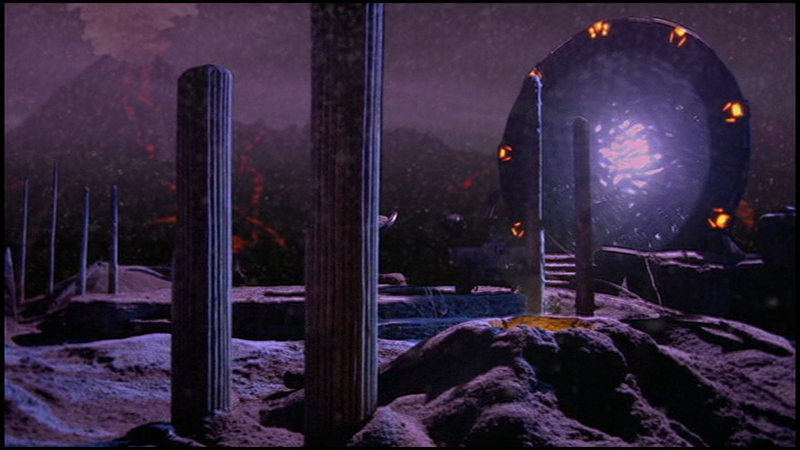 The episode begins with SG-1 emerging from a Stargate onto a world that is undergoing massive volcanic activity and is already being buried under ash. While getting ready to dial Earth they find many people in advanced protective suits dead or dying around them. While checking for survivors one of them deliriously sees Carter and another grabs her telling them not to help them. Back at the SGC SG-1 debrief Hammond as to the people they evacuated and the fact they appear to be much more advanced than they are which Daniel theorises is due to them not having a cultural Dark Age. After being told the unknown people’s leader had awoken they proceed to the infirmary where the leader, Omoc, talks down to them, claiming that they stopped them being rescued, and snubs Hammond’s attempt at dialogue over a ‘shared enemy’ in the Goa’uld and simply demands to have their equipment returned and be let go. One of the other survivors takes an interest in Carter during the meeting. Later on while prepping a UAV Carter is interrupted by Daniel who informs them that so far all attempts at dialogue had been unsuccessful but that one of them, a man called Narim, wants to speak to Carter. Hammond, hoping to encourage a dialogue, lets Carter and Narim go outside the base, on condition Narim gives his word to not escape (similar to parole). During their trip outside it emerges that in many ways Narim’s people, the Tollan, are similar in culture but more advanced technologically, with them lacking other animal species (birds in particular), looking down on religion and mythology, and viewing themselves as superior. Despite a good conversation, that includes some awkward flirting, Narim becomes closed-off when he notices the guards following. Eventually the SGC is ready to launch a UAV to the planet and finds that the volcanic activity has intensified, making the world uninhabitable. After informing Omoc of this he opens up slightly, revealing that their world is falling apart and that his team were closing off the Gate for safety but are now stuck on Earth as their new world is outside the system, meaning they’d need a spacecraft. At the temporary housing facility on the base Hammond, Daniel, and Omoc further discuss the situation, revealing that they’re trying to find other worlds that could help them and that the Tollans will be free to choose to go wherever they want but won’t be allowed to go elsewhere on Earth due to quarantine protocols. Carter spends more time with Narim, bringing him a cat to keep him company, with the two of them bonding over their shared love of physics, Narim once again revealing how advanced the Tollans are by referring to Quantum Physics as a ‘misconception’. Omoc however comes other, causing Narim to become silent. That night however the Tollans disappear with them being found outside the base observing the stars. Omoc is angered by this, claiming that they’re prisoners. Despite this incident however they introduce the first of the offworlders, with a representative of ‘The Land of Light’ wanting to bring them in, a request Omoc laughs off, labelling them as ‘even more primitive’ than the Tau’ri. Carter goes to Narim for an explanation who tells her that the Tollan had originally shared technology with a neighbouring planet similar to Earth’s level of advancement. Despite peaceful intentions however the planet used the technology to make war amongst themselves, destroying themselves and causing the predicament the Tollans are in. The SGC are able to find footage of how the Tollans escaped from the room which was via their devices which effectively made the wall non-physical. However the Pentagon send Colonel Maybourne of the NID to obtain the advanced technology the Tollans have by taking the Tollans into their custody. Hammond however makes up an excuse about quarantine to buy them a day so that they can help the Tollans avoid this fate. Daniel goes to Omoc to get his help in an escape plan by making contact with the Nox to which Omoc, while hesitant, agrees to. While sending the message with Daniel Omoc’s demeanour begins to change, with him becoming friendlier, most likely due to him seeing that the SGC are honouring their word. Narim goes to say goodbye to Carter, with them getting close before Daniel interrupts, needing Carter’s help setting up the final escape. An airwoman goes to see Hammond to tell him that the Tollans have escaped. The base alarm sounds, with the Gate activating and the Iris failing to close, with Lya of the Nox coming through. Maybourne however demands that the defence team are allowed to open fire if needed but the Tollan go through the Gate anyway, with Lya making their weapons disappear and the Tollans invisible. Enigma is a very interesting episode as at its core it’s a condemnation of the Allied Powers for their behaviour during the end of the Second World War and how the West views other nations. For the first point it focuses on the behaviour of the Allies where, during the closing months of the Second World War, they extracted Axis scientists who worked on advanced programs including rocketry. We see this with the treatment of the Tollans by the Pentagon as they both want to use them to advance their own technology and see that giving them a nice life, but one they have no control over, is a fair trade. The SGC however disagrees, seeing it as no life at all and instead successfully orchestrates their escape with the help of the Nox, directly defying the President’s orders. With the latter point the contempt the West still shows towards other nations, in particular those in the Middle-East, portrayed via the behaviour of the Tollans towards the Tau’ri. In particular they view them as beneath them based solely on their technological level and therefore are subject to mockery, routinely being referred to as primitives. It is only later on when they see them for who they are and the sincerity in their actions do they comes to see the SGC in particular as equivalents. Overall this is a good episode with a message at its heart which is where as a society we’re heading due to our own choices, such as the damage we have caused to the planet, but also a reflection on what nations have been willing to do in the past just to gain an edge over others and the humanity that is lost in the process. · I like how Narim takes the cat with him even though there’s no guarantee they’d be able to feed the thing. · Is it just me or do one of the Tollan and one of the SGC guards look to be flirting in the background during the scene where Carter helps Niarim with his bed? Quote of the episode: “Promoted? Talk about failing upwards.” -O’Neill’s on Kennedy being replaced. This episode starts with the Gate starting up and the base being on alert. Harriman tells Hammond that it’s SG-1 who had only just departed. The Gate activates but begins to respond strangely, with Daniel and Teal’c thrown through the Gate before it shakes violently, destroying the supports, and shutting down. Teal’c tells Hammond that Carter and O’Neill were just behind but haven’t come through. However we cut to another Gate in an unknown ice-filled cavern where O’Neill and Carter are. In the infirmary Hammond talks more with Teal’c revealing that the Gate still isn’t working and that they won’t be sending support through till it’s repaired. Teal’c, despite a broken arm goes to assist, with the chief engineer Silar giving an estimate of at least 24 hours before they can try the Gate again. In the cavern Carter wakes and has a look around, not being able to find a way out, explaining this to O’Neill when he wakes up. Carter thinks he has a broken leg and is forced to splint it, despite having no training to do so, with her getting O’Neill to talk about a previous fracture, where he reveals during a black op during the 80s he was forced to walk nine days to rescue after his chute opened late during insertion while heavily injured. While O’Neill remains focused on finding a way out Carter is much less hopeful given the situation. Back in the infirmary Daniel finally wakes from his injuries, with Teal’c revealing what happened, both agreeing that the others must’ve made it through the Gate. However by this time Silar has managed to fix the Gate and a team is already ready to go back to the planet. A probe is sent through and finds no sign of battle or debris that indicates O’Neill and Carter are still there, however the probe is destroyed by Staff fire forcing the rescue mission to be scrubbed. With O’Neill up and moving in the cavern the two of them start looking, with O’Neill thinking that Carter could climb up the cavern and out the hole in the roof. Carter however manages to locate the DHD in a block of ice and begins to cut her way through it. Carter theorises that the Gate must’ve malfunctioned and sent them somewhere else but don’t know if Teal’c and Daniel made it to Earth and argues against the ability for them to find them again due to the number of addresses they’d have to search. O’Neill, largely useless due to his injuries and non-scientific knowledge, is confined to soup dispenser and starts to ignore all of Carter’s wild theories, which include that the planet they’re on must be somewhere in the path between the planet and Earth. Back on Earth Daniel and Teal’c come to the same conclusion that they must be on another planet but need to narrow down which planet they could be on. With Silar’s engineering know how they conclude that the planet the others ended up on must be in the path between Earth and the star planet, only giving them a dozen or so possibilities. The first few possibilities come up negative however and Hammond is forced to formally report the two as MIA. In the cavern O’Neill decides to help Carter break through the ice, finding a frozen Serpent Guard in the ice. Eventually they make it to the DHD but O’Neill’s injuries start to show. They dial Earth but it doesn’t connect. O’Neill decides that they should give up and sleep for a few hours first. After hours of trying again the next day O’Neill tells Carter she should begin climbing out and making her way across the surface. However upon doing so all she finds is a desolate wasteland. At the SGC Hammond is forced to call the search off as the final of the possible planets ends up empty, however later that night Daniel witnesses the Gate light up with no result and realises that they ruled out a planet they shouldn’t have, Earth itself. Hammond agrees to look for any sign of seismic activity that would coincide with the activity witnessed with the only place matching being activity in Antarctica. Back in the cavern Carter and O’Neill give up hope of being rescued but a rescue team arrive with Hammond and the others in tow. The episode ends with the now lit up Gate in the cavern being viewed by Hammond. This episode is a pretty good one in that it further sets up not only the fact someone else must’ve been to Earth but Ra thousands of years before but that they weren’t likely the Goa’uld either. Also it forces Carter to have to take command in a desperate situation given how O’Neill is slowly dying due to his injuries while on the flipside Teal’c and Daniel have to rely on the SGC to help them figure out what could’ve happened as the resident geek is lost. Once again we see just how sizable the SGC has grown in a short period of team with multiple teams being sent off-world in the hope of finding their lost comrades but even so aren’t without fault, with missions getting scrubbed due to strategic disadvantages of having to emerge from a single point of entry usually placed in open terrain. Overall it’s a nice little episode that not only opens up the world they’re building but also begins the setting of what would eventually lead to Stargate: Atlantis as well. · The ‘strudel’ effect from the film makes a reappearance with the area behind the Gate also being destroyed by the activation. · I think this might be one of the few appearances where Silar isn’t injured in the process of making an appearance.